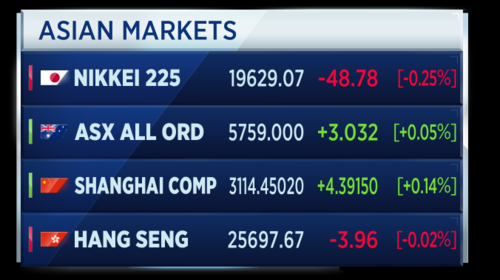 Good morning, and welcome to World Markets Live! The blog will begin full news coverage from 06:00 a.m. GMT, but for starters, here are the opening calls for European markets from IG. May-day at the polls for Britain's Conservatives. 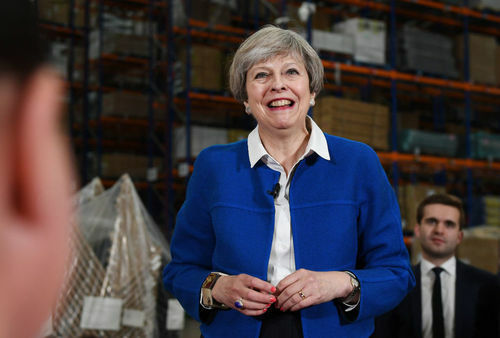 A YouGov study quoted by the Times says Prime Minister Theresa May could lose her Parliamentary majority in next week's election, sending sterling into the red. Some correction in stocks could be healthy, says Dallas Fed President Robert Kaplan, but he tells CNBC two hikes are still on the table this year. U.S. Commerce Secretary Wilbur Ross tells CNBC he is open to re-starting talks on a trade deal with Europe, despite Donald Trump issuing a slew of angry tweets towards Germany over its trade surplus. Russia's finance minister tells us exclusively he hopes sanctions can be relaxed to allow for an increase in capital flows between the U.S. and Russia. CNBC Willem Marx reports on the poll showing the Conservatives could lose their majority in the U.K. Parliament. When (Theresa May) called this election several weeks ago, she had a 20 percent majority. It was a record, in terms of voter intentions. We’ve seen national polls up until now, but the first time that YouGov have done this modelling based on constituencies, by seat-by-seat for MPs, we’re now seeing this massive, massive change. The YouGov modelling projects the Conservatives will win the U.K. election, but fail to secure a majority, resulting in a hung Parliament. The Irish government has launched an initial public offering for Allied Irish Bank, with 25 percent of shares to be issued to raise an estimated 3 billion euros. 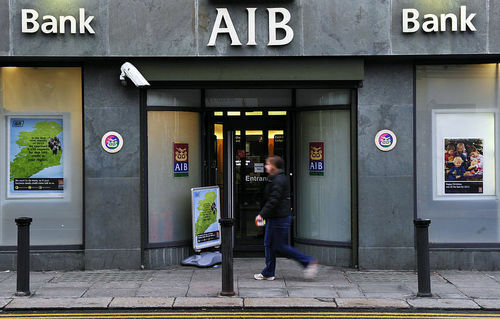 AIB, which was bailed out by Dublin, returned to profit three years ago. The listing would represent one of the largest in European banking since the financial crisis, and is expected to take place in mid-June. 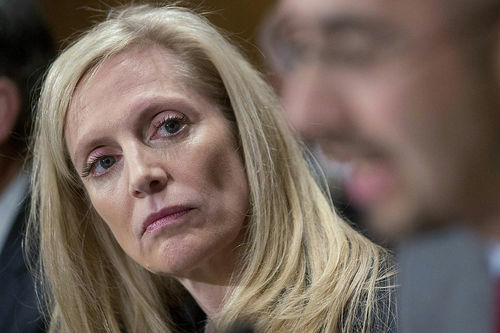 Fed Governor Lael Brainard (pictured) says it's reasonable to assume more Fed rate hikes are on the way, but warned that soft inflation could slow the pace of hikes. In a speech in New York, Brainard said the "apparent lack of progress in moving core inflation back to 2 percent is a source of concern". Meanwhile, Dallas Fed President Robert Kaplan said he expects two more rate hikes in 2017. Speaking to CNBC, Kaplan said he believed any removal of accommodation should be done "gradually and patiently." U.S. markets slipped lower on Tuesday on the first trading day after the long weekend. The indexes fell despite Amazon's share price rising above $1,000 for the first time in its history. 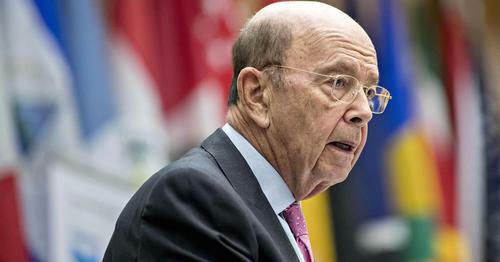 U.S. Commerce Secretary Wilbur Ross has told CNBC he is open to resuming trade talks with Europe. It comes amid a slew of tweets from President Trump, pointing the finger at Germany and its trade surplus. Ross told CNBC that - as one of the largest trading partners - the U.S would want to negotiate with the EU as a bloc, rather than individual nations. CNBCTalks around the TTIP, a proposed US-EU trade deal, were put on hold following Trump's election last year. The eyes of the business world turn to Russia this week for the St. Petersburg International Economic Forum. 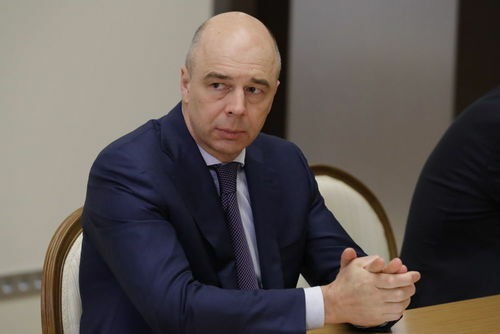 Geoff spoke to Russian Finance Minister Anton Siluanov and asked him if he sees this year's event as a revival in U.S.-Russian business relations. We are interested in joint investments and partnership with all our western colleagues and partners, including American business. We see that the Russian economy has started to develop at a higher rate. It has come out of recession this year and we anticipate annual growth of around 2 percent. We also see, as we said, the inflow of investment, both direct and financial investment including from American investors. We welcome any investors in Russia and we ensure these investments in Russia, these investments from business in Russia, will let them attain good yields, strong, reliable yields. A Russian warship and submarine have launched cruise missiles from the Mediterranean to Islamic State units near Palmyra, according to Interfax news citing the defence ministry. Russian military warned the U.S., Turkey and Israel before launching the cruise missiles. German retailer Metro reports a Q2 EBIT of minus 19 million versus a positive 38 million last year. This follows a planned demerger. Asian stocks cap a fifth month of gains, helped by data showing China's factory activity grew steadily. Japan's Nikkei closed lower, while the rest of Asia was broadly flat. 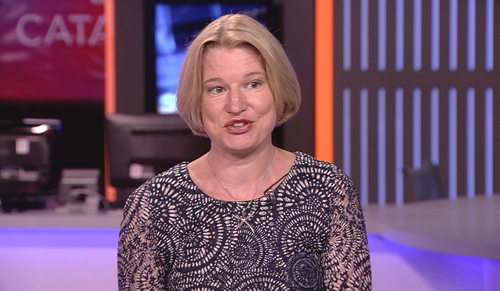 Miranda Carr, head of China thematic research at Haitong Securities, says China is sending out confusing signals. There’s state-manipulated prices. When we saw the reflation trade in Q1, a lot of that was down to state intervention and supply side reform. Steel prices, iron ore prices, coal prices all went up, everyone thinking ‘this is a sign of massive reflation,’ ignoring the fact it was actually state intervention which did it. Now that’s coming off, the input prices we’re seeing dipping on the PMI numbers for the first time and so we’re now in a deflation, but it’s false signal. German Chancellor Angela Merkel has called on the EU to improve its progress on passing a free trade agreement between the bloc and India. 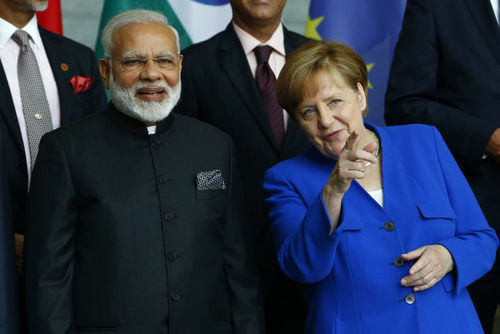 Speaking alongside Indian Prime Minister Narendra Modi at a Berlin Business Forum, Merkel warned of the rise of "protectionist tendencies" across the world. Germany is the first stop on a four-country tour by the Indian Prime Minister, where he will also visit France, Spain and Russia. Active money managers are doubling down on tech, according to Bank of America, which says statistics show investors are holding a record amount of overweight positions. Big tech firms have accounted for a third of the overall gains in U.S. stocks this year, with data from Howard Silverblatt showing Apple, Amazon, Facebook, Microsoft and Alphabet enjoying the most significant share price jump. Amazon broke above $1,000 for the first time ever in yesterday's session. Sterling is recording losses today following the latest YouGov poll which predicts the Conservatives will lose their Parliamentary majority in the upcoming U.K. general elections. Shares in the newly created Janus Henderson Group are due to begin trading on the New York Stock Exchange today. Asset managers Janus and Henderson took the decision to merge at a time of increasing fee pressure and industry outflows. The firms expect to realise $110 million in cost savings per year as a result of the deal. Here's a reminder of the top headlines this morning. May-day at the polls for Britain's Conservatives. A YouGov study quoted by the Times says Prime Minister Theresa May could lose her Parliamentary majority, sending sterling into the red. 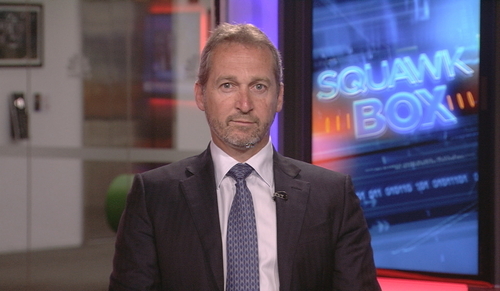 Some correction in stocks could be healthy says Dallas Fed President Robert Kaplan, but he tells CNBC two rate hikes are still on the table this year. 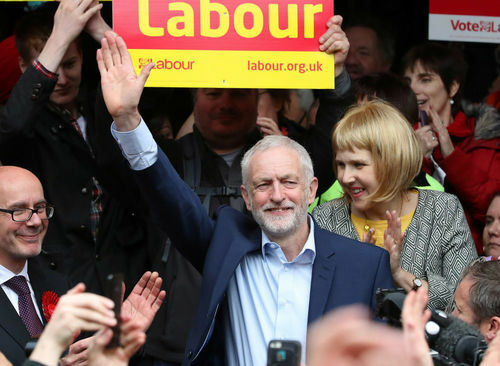 Speaking on the campaign trail, Theresa May ramped up the personal attacks on her rival, saying Labour leader Jeremy Corbyn would be "naked in the negotiating chamber" if he was in charge of Brexit talks. The Prime Minister went on to explain how the Brexit vote was a wake up call for politicians. At his own event, meanwhile, Jeremy Corbyn criticised what he called the Conservative party's neglect of small businesses. The opposition leader said the Tories were only interested in helping out their "super rich friends." 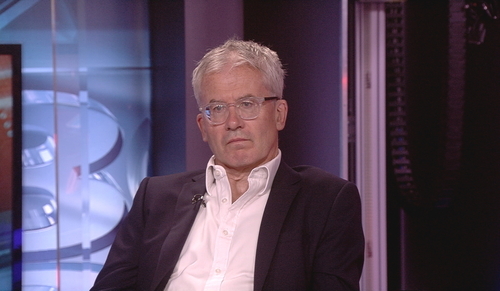 David Miles, professor at Imperial College Business School and former Bank of England MPC member, discusses the problems Theresa May is facing on the campaign trail. I’m sure Theresa May wanted the campaign to be all about Brexit and it’s not all about Brexit. There’s a lot of focus on the National Health Service, education and social care, and that’s not terrible helpful for the Conservatives. And maybe people are less concerned and worried immediately about Brexit, partly on the back of reasonable economic outcomes since the referendum a year ago. German retail sales for April decreased 0.2 percent month-on-month and decreased 0.9 percent year on year. This versus forecasts for growth of 0.2 percent and 2.3 percent respectively. Also, seasonally adjusted ILO employment increased 31,000 in April, versus an increase of 41,000 in March, according to the Statistics Office. 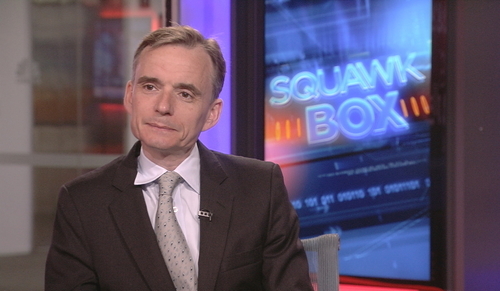 David Stubbs, global markets strategist at J.P. Morgan Asset Management, says June is highly likely for a Fed interest rate hike, as growth is going to bounce back in the second quarter. Even with the weak first quarter, nominal GDP growth year-on-year is above the cycle median. Real final purchases by domestic players are again above the cycle media, so that’s no inventories, no trade, no government, that core private sector domestic growth is there. And maybe most importantly of all, financial conditions are actually a lot looser than when the Fed hiked interest rates in December. Credit spreads are tighter, equities are higher and you have a buoyancy of global demand conditions and sentiment. 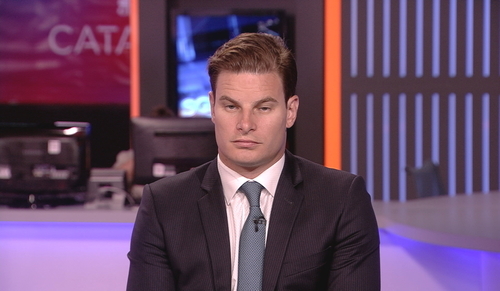 Stubbs suggest this is a good window of opportunity for a rate hike. Reports suggest at least 15 people are killed and 300 are wounded by a massive car bomb in Kabul, which explodes near the Presidential Palace and a number of foreign embassies. A health official says the casualty toll will rise, according to Reuters reports. Around 20 minutes to the opening of European markets. 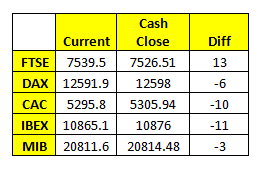 Here are the calls for the major individual bourses. The preliminary reading for French EU-harmonised inflation in May is 0.9 percent year-on-year (lower than the 1.1 percent forecast) versus 1.4 percent in April, according to INSEE. French producer prices in April fell 0.4 percent month-on-month, but remained 3.3 percent positive year on year. 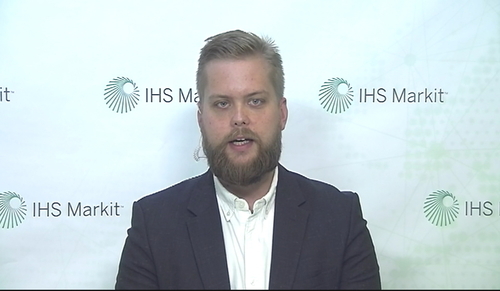 Christopher Granville, managing director of EMEA & global political research at TS Lombard, says the oil price is now a more serious cause for uncertainty in the Russian economy than sanctions. When sanctions first started, the markets didn’t know where it was going to end and had to price discount a much greater escalation, but now I think markets understand the sanctions situation is very sticky: it isn’t going to get better very soon, doesn’t look like it’s going to get worse either. But the oil price is essentially being artificially supported by this OPEC-Russia deal and is being overtaken by massive expansion of shale oil production in the U.S.
Granville says the oil price isn’t yet at a market clearing level. Deutsche Bank announces it has signed a 5 year, $3 billion cooperation deal with the China Development Bank. The deal aims to finance economic cooperation between China, Germany and other countries in the Belt & Road initiative. The cooperation also aims to promote renminbi internationalisation. Meanwhile, Deutsche Bank has been fined $41 million by the Federal Reserve for anti-money laundering failures, after the central bank found the German lender had faulty systems that failed to detect dubious financial transactions between 2011 and 2015. Deutsche Bank said it would increase its control and was "committed to implementing every remediation measure." 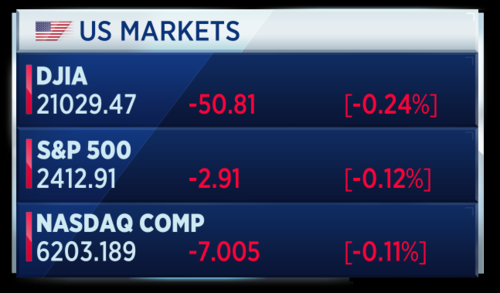 European markets are now open and the Stoxx 600 has opened cautiously lower, nudging just 0.1 percent into the red. 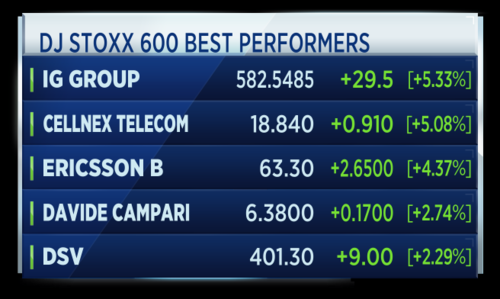 The tech and telco sectors are leading the Stoxx 600 today, but the basic resources sector is down more than 1 percent, weighing heavily on the pan-European index. These are some of the stocks to watch this morning. 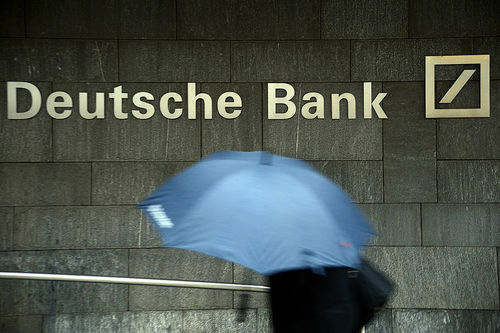 Deutsche Bank has just revealed a $3 billion cooperation with China Development bank. The lender says the deal is aimed at financing economic cooperation between Beijing and Berlin, most notably China's new Silk road infrastructure initiative. Metro reported a loss in its second quarter operating profit, while sales remained flat due to weakness key Western European markets.The German retailer, which is planning to split into two separate companies, also maintained its guidance for the full-year. 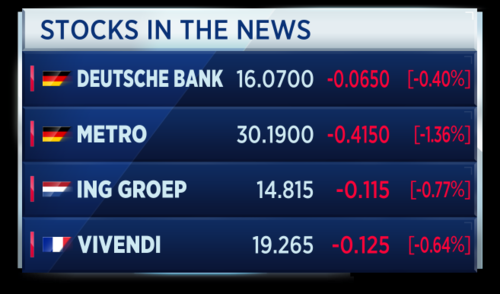 HSBC has cut Dutch bank ING to hold from buy. The British lender also raised the price target by 20 cents to 15 euros 20. Vivendi has gained EU approval to take full control of Telecom Italia. This after the French media group agreed to sell the Italian company's majority stake in broadcasting services group Persidera. EU antitrust regulators had voiced concerns that Vivendi, which also owns a significant stake in Mediaset, could charge TV channels more for wholesale access to its networks. 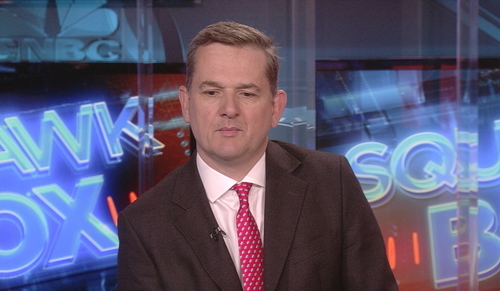 Charles Newsome, investment director at Investec, says investors should not worry too much about the latest YouGov poll showing the Conservatives may lose their majority in the U.K. general election. My understanding is this poll is using a new methodology to approaching the polls and we’ve seen a number of polls over the last few big elections which have been completely wrong and to focus on one which is very different from the general trend. Okay, the general trend has been moving towards Corbyn, but I can’t honestly see Jeremy Corbyn getting more MPs into the House than Ed Miliband managed to do in 2015. At least 80 people have been killed and more than 350 wounded following a massive car bomb explosion in Kabul, according to Reuters citing the Afghan public health ministry. 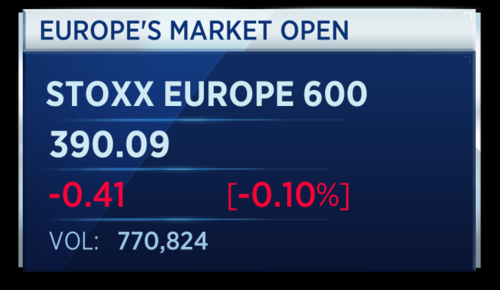 The Stoxx 600 has opened marginally lower at the start of Wednesday trade. It is currently down 5 basis points. 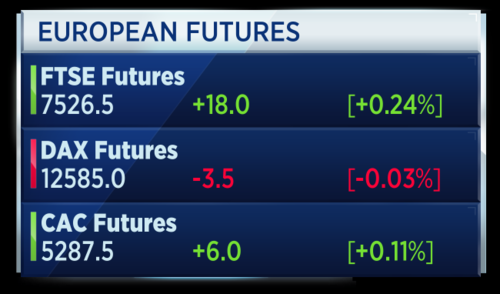 Here's a look at the individual European bourses, which are more mixed. The U.K's FTSE 100 is up around 0.2 percent thanks to the fall in sterling - many FTSE 100 stocks make their earnings abroad, so a falling sterling boosts their foreign returns due to the currency effect. Click or tap on the arrows to switch between charts. Here's CNBC's Uptin Saiidi with TL;DR to update you with the main headlines coming from Asia. 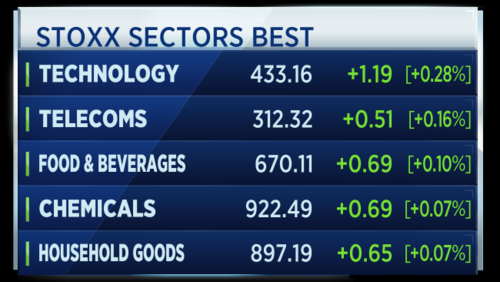 These are the top headlines following the market open. A massive blast rips through Kabul as a truck bomb kills more than 60 people and leaves over 300 injured, in an area of the Afghan capital dominated by government buildings and foreign embassies. Ireland launches Europe's biggest bank listing since the financial crisis, as it looks to return Allied Irish Bank to private ownership with a 25 percent share sale. An activist investor creates a connection for Ericsson. Shares in the Swedish telecom equipment maker rally as Cevian Capital buys a stake of just over 5 percent citing the company's "potential." 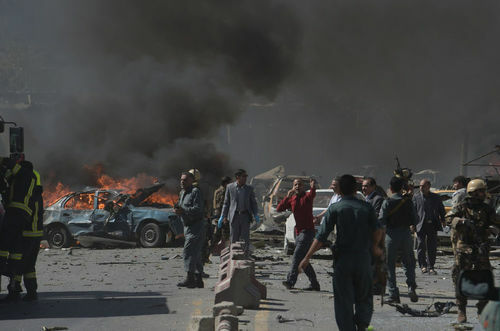 A massive car bomb has rocked central Kabul, killing more than 60 people and injuring over 300 people. That's according to the Interior Ministry. French and German embassies located in the area have been damaged, however the number of foreign victims has yet to be determined. CNBC's Willem Marx says the explosion in Kabul took place during the middle of rush hour in a very busy section of the city. There are some very legitimate questions to be asked about how something potentially truck sized, filled with explosives, could pass right into this very secure zone. You’ve got three meter high blast walls everywhere, checkpoints, it’s very close to the presidential palace, very close to the head of the Afghan secret police. 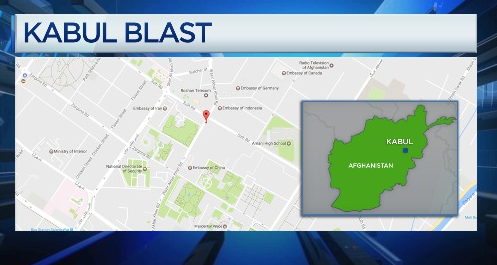 The idea that an explosion could take place there is going to be very concerning to Afghan officials and embassies nearby. Shares in the newly created Janus Henderson Group are due to begin trading on the New York Stock Exchange on June 2nd. Asset managers Janus and Henderson took the decision to merge at a time of increasing fee pressure and industry outflows. The firms expect to realise around $110 million in cost savings per year as a result of the deal. Andrew Formica, Co-CEO of Janus Henderson, says it is important for asset management businesses to be truly global in order to deal with the challenges facing the industry, and discusses the impact of regulations on the industry. I think people recognize the strength that the asset management industry has, despite many of the challenges that we see in markets and the change in buying patterns, asset management firms continue to offer very strong growth prospects. The asset management space is going through a significant amount of change and pressure. Some of that is the regulation that we face, but it’s also equally the regulation that faces some of the large distributors we have, whether they’re insurers or banks who often act as the intermediary to the client. The changes they’re facing from regulation is changing the way they look to partner with firms such as ours. Germany's seasonally adjusted jobless total falls 9,000 to 2.536 million in May, according to the country's Labour Office. That compares to a forecast fall of 15,000. The jobless rate is down to 5.7 percent from 5.8 percent in April. Some more data points from earlier. Denmark's Q1 GDP grew 2.2 percent on the year, 0.6 percent on the quarter, better than expected. Norway's April credit indicator is up 5.1 percent year on year, slightly lower than forecasts of 5.3 percent. The Household credit indicator grew 6.5 percent, while the business credit indicator was up 2.3 percent. Italy's April jobless rate falls to 11.1 percent, its lowest since 2012, versus 11.5 percent in March, according to ISTAT. Here are the top headlines for the hour. Otso Iho, senior analyst at IHS Jane's Terrorism and Insurgency Centre, says no one has yet claimed responsibility for the bomb blast in Kabul which has killed more than 60 and injured more than 300 people. Kabul has been targeted in the past by both the Taliban and the Islamic State, of course, so there’s a range of possibilities here still at this point, but given the launch of the Spring offensive and the high frequency of attacks around Kabul, it is likely that the Taliban might be behind this particular massive attack. Shares in Ericsson are trading near the top of the Stoxx 600 after Cevian Capital revealed it has taken a stake of just over five percent in the Swedish telecom equipment maker. The activist investor says it sees "significant potential" in the group. Meanwhile, Metro reported a loss in its second quarter operating profit, while sales remained flat due to weakness in key Western European markets. The German retailer, which is planning to split into two separate companies, also maintained its guidance for the full-year. 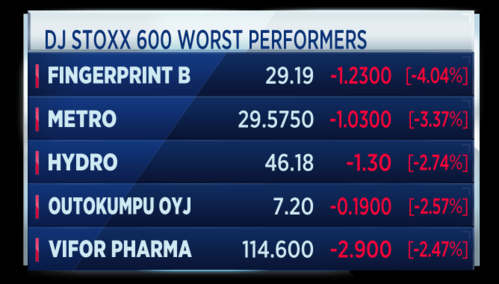 Here's a look at the other stocks at the top and bottom of the index. 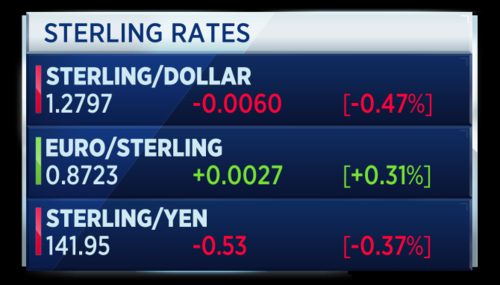 Sterling has weakened following a YouGov poll suggesting the U.K. general election will result in a hung parliament. Caroline Simmons, deputy head of the U.K. investment office at UBS Wealth Management, weighs in on the currency, saying they have a range of $1.25 to $1.30 versus the dollar. Over the much longer term horizon, we are anticipating further dollar weakness, which would mean that cable continues to rise. We will need to see how the election turns out: share vote does not necessarily translate into seats, as we have seen in previous elections. ECB board member Benoit Coeure says European officials need to reach a deal on debt relief for Greece at the next Eurogroup meeting scheduled for June 15. Speaking earlier this morning, he said that a fresh debt agreement for Greece would help restore investor confidence in the country. He added that ECB needs clarity on the country's debt reduction plans before its bonds can be considered for inclusion in the central bank's QE programme. 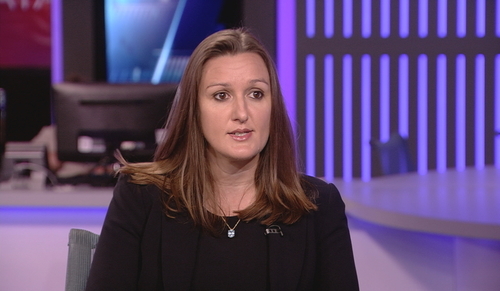 Caroline Simmons, deputy head of the U.K. investment office at UBS Wealth Management, says here firm's assumption is there will be an agreement between Greece and officials that enables the country to repay its bonds when they are due. It doesn't affect our overweight position on the Eurozone equity markets. We are also forecasting the ECB to taper. That will start in January, and it doesn't prohibit us from wanting to have an overweight on the Eurozone market. We think that the fundamentals have been improving from a very low base. It has been lagging, particularly with the U.S. and global markets, for many years now. There's a lot of catch-up recovery and therefore you do have a higher operating leverage in the Eurozone markets.